The famous poet, George Herbert, is most-widely remembered for his poems and popular hymns, such as The God of Love My Shepherd Is, King of Glory, King of Peace, Let All the World in Every Corner Sing and Teach Me, My God and King. Besides being reputedly the most skillful and important devotional lyricist of his time, he was also an Anglican priest and pastor. He studied in Cambridge and was later associated with the villages of Leighton Bromswold and Little Gidding in Cambridgeshire. 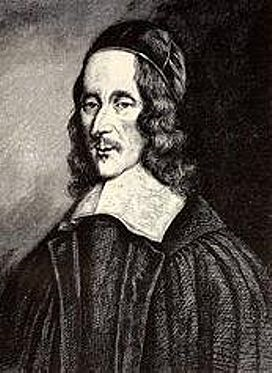 George Herbert was born into an artistic and wealthy family in Montgomery, Wales, in 1593, He was one of ten children, but at the age of three his father died. His mother moved the family to England, where she became a patron of the poet and clergyman John Donne. Herbert received a good education that later led to his holding prominent positions at Cambridge University and in Parliament. He studied at Westminster School and soon began to display his own gift for poetry. He went on to Trinity College, Cambridge, where he excelled in languages and music. He earned his bachelor’s degree in 1613 and his master’s degree three years later. His early ambition was to become a priest, but his scholarship attracted the attention of King James I. In 1620 he was appointed University Orator, whose duties included welcoming distinguished visitors and acting as a sort of an ambassador for the school, writing and delivering speeches to the King. He seemed destined for a career as a courtier, and served in Parliament for two years. But after the King’s death, a friend encouraged him to renew his interest in ordained ministry and he sought ordination – an unusual step for a man of his rank and family background. He was first made deacon, and in 1626 appointed a canon of Lincoln Cathedral. His mother died in 1627 and he expressed his grief in verse, penning several poems in tribute to her. Herbert also resigned his post at Cambridge that same year. He married Jane Danvers in 1629. His cathedral canonry was associated with the parish of Leighton Bromswold, then in the diocese of Lincoln. Although he had no duties there, he discovered that the building was derelict and he set about raising money and restoring it. The Cambridgeshire church stands today as a physical parallel to his poetry and theology. The pulpit and reading desk are given equal prominence, whilst only a very low screen separates the chancel from the nave of the cruciform building. 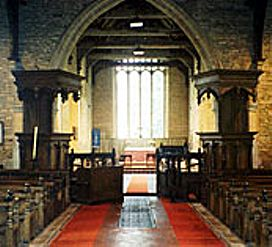 The church was beautifully decorated, and its restoration indicates Herbert’s preference for proper, but reformed ceremonial, and a balance between preaching and sacrament, marking out a middle ground between conflicting doctrines – a position which came to be seen as quintessentially Anglican. In 1630 Herbert was appointed rector of Bemerton, close to his family seat at Wilton, near Salisbury. There he ministered diligently despite his failing health. While dying from tuberculosis, he sent a collection of his poems to his Cambridge friend Nicholas Ferrar, who had founded an Anglican community at Little Gidding – just two miles down the road from Leighton Bromswold. Herbert instructed his friend to publish the poems if he thought they might “turn to the advantage of any dejected poor soul”, otherwise to burn them. He died in 1633, but Ferrar edited the manuscripts for publication, ensuring Herbert’s fame as a theological poet and hymn writer. The Church of England commemorates George Herbert’s death on 27th February, the date Dr Rowan Williams chose for his enthronement as Archbishop of Canterbury in 2003.